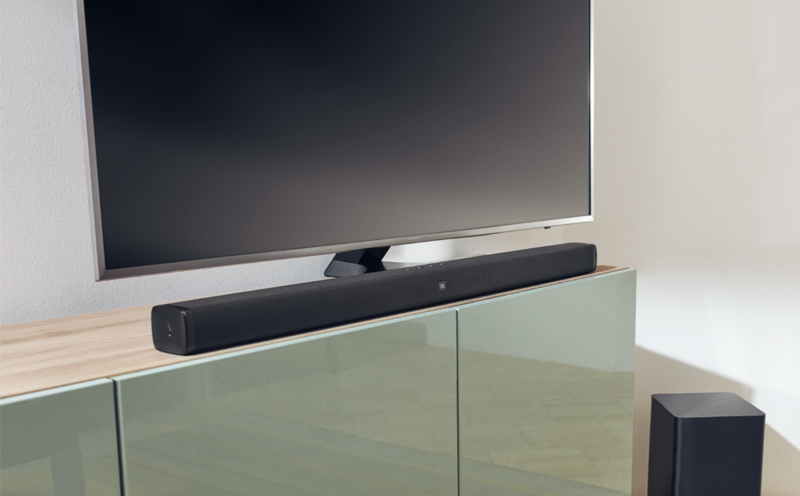 Active Soundbar: The JBL BAR 2.1 system is a great choice for movie and music soundtracks. The JBL BAR 2.1’s active soundbar speaker houses two 1.25″ tweeters and four 2.25″ racetrack drivers powered by a 100 watt (Peak) amplifier. JBL Surround Technology: The soundbar incorporates JBL’s Surround Sound Technology with six sound modes to choose from – including Standard, Movie, Music, Voice, Sports, and Off (Stereo). Night Mode: There is also a Night mode that reduces major volume differences between soft and loud passages, so a more uniform volume level can be maintained. Audio Sync: In addition, the Audio Sync feature makes sure that the sound from the BAR 2.1 is in sync with the video on your TV; the Audio Sync can be adjusted from 0-250ms. Wireless Powered Sub: The JBL BAR 2.1’s wireless powered sub features a down-firing 6.5″ woofer in a bass reflex enclosure with a rear-firing port. A built-in 200 watt (Peak) amplifier is used to drive the 6.5″ woofer and deliver deep, impactful bass. Because the powered sub is wireless, it puts no unsightly cables between the soundbar and subwoofer (still requires a AC power cord connection). You can adjust the bass level (0-20) of the powered sub from the included IR remote. HDMI 1.4 Input/Output (ARC): The JBL BAR 2.1 is equipped with one HDMI 1.4 input and one HDMI (ARC) 1.4 output. The HDMI input and output support up to 1080p video (including 3D), as well as 5.1ch Dolby Digital and 2ch PCM. The HDMI (ARC) output allows audio to be sent from your ARC compatible TV to the BAR 2.1 through the same HDMI cable already being used to send audio and video to your television, eliminating the need for extra cables connected to your TV. Note: The ARC-enabled HDMI input of many televisions only sends an audio signal in 5.1ch when receiving Dolby Digital from the TV’s built-in tuner, network connection, or connected USB device; and will output only 2ch stereo from sources connected to the TV via HDMI, or RCA (like your Blue-ray/DVD player or satellite/cable box). Optical Digital & Analog 3.5mm Inputs: In addition to HDMI connectivity, the JBL BAR 2.1 is outfitted with one optical (toslink) digital input and one analog stereo minijack (3.5mm) input. The optical digital input will support 2ch PCM and Dolby Digital (up to 5.1ch). Note: The digital optical output terminals of most newer flat-panel TVs only send an audio signal in 5.1ch when receiving Dolby Digita surround sound from the TV’s built-in tuner, network connection, or connected USB device; and will output only 2ch stereo from sources connected to the TV via HDMI, or RCA (like your Blue-ray/DVD player or satellite/cable box). USB-A 2.0 Port: The JBL BAR 2.1 features a USB (type-A) 2.0 port for connection of a USB MSC (mass storage class) device, such as a USB thumbdrive or portable digital audio player. You’ll be able to playback MP3 and WAV music files stored on a USB MSC device (formatted in FAT 16/FAT32) through the JBL soundbar system. The system can recognize up to 2,000 MP3 files. You’ll also get basic playback control (such as Play/Pause, Previous/Next Track, and Random/Repeat) from the included IR remote. Advanced music browsing and song/artist/album info display are not supported. The USB port can also be used to charge (5V/1A) your connected device. Bluetooth Audio Streaming: The JBL BAR 2.1 is equipped with built-in Bluetooth 4.2 with support for wireless audio streaming (A2DP 1.3) and playback control (AVRCP 1.6). You’ll be able to wirelessly stream stored music, music apps, and other audio content from your Bluetooth-enabled device (such as your smartphone, tablet, laptop, or computer) to the soundbar speaker system. You’ll also be able to control basic playback functions (such as Play/Pause & Previous/Next Track) from the included IR remote. You will still use your Bluetooth source device for advanced music browsing and to view song/artist/album info. You can pair multiple Bluetooth devices with the BAR 2.1, but only one device can be used for playback at a time. The system has a wireless Bluetooth range of approximately 32′. Note: The JBL BAR 2.1 does not support Bluetooth hands-free communication for making and answering phone calls. 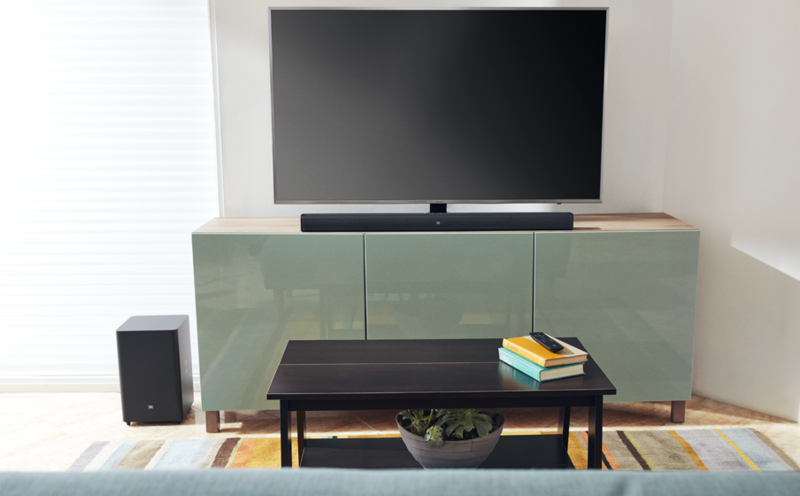 JBL SoundShift Technology: The JBL BAR 2.1 is further enhanced with JBL SoundShift technology, which allows you to instantly switch between sound from your TV and sound from your Bluetooth source device. Remote Control: The JBL BAR 2.1 comes with an IR remote for wireless control of the soundbar system, as well as basic playback control of USB & Bluetooth connected devices. The system also supports “System Standby” and “One Touch Play” HDMI CEC commands. In addition, the BAR 2.1 can respond to “Volume Up/Down” and “Mute” commands from most Samsung, Sony, LG, and Vizio TV remote controls automatically (no programming required). If your TV’s remote does not control the soundbar automatically, you can program the BAR 2.1 to respond your TV remote’s “Volume Up/Down” and “Mute” commands. 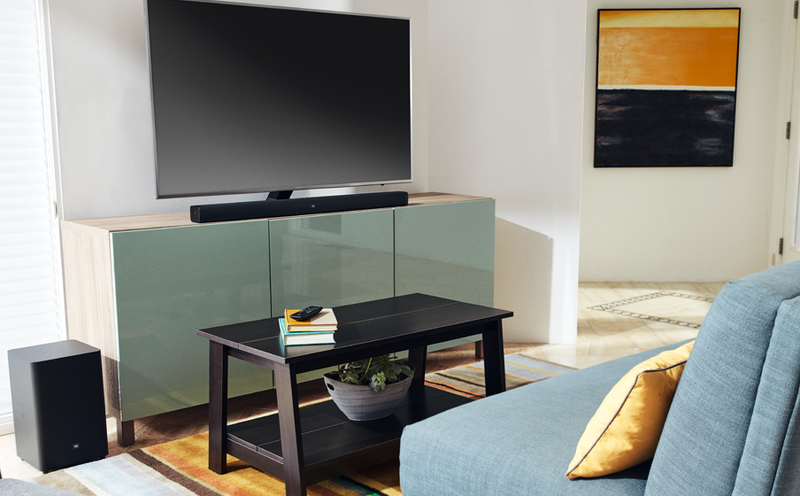 Mounting Options: You can place the JBL BAR 2.1’s soundbar speaker on a shelf or tabletop, or wall-mount it with the included brackets. Because the powered subwoofer is wireless, you can position it any where in the room (within 25′). Power Requirements: Both, the active soundbar and wireless powered sub, will need to be plugged into an AC wall outlet, surge protector, or power conditioner. Each includes a detachable 5′ AC power cord. Auto On + Standby: The JBL BAR 2.1 system will automatically power on whenever it senses an audio signal from its HDMI & Optical source inputs. The JBL BAR 2.1 will automatically switch to standby mode after approximately 10 minutes of button inactivity and no audio playback from a connected source.